ONE BILLION – this is the number of innocent souls tobacco will kill worldwide this century if urgent and drastic action is not put in place to stop this dilemma. Everyone knows by now that it is one of the most easily preventable causes of death, and yet some leaders and citizens will prefer to fold their hands and do nothing. In the United States alone, tobacco kills 443,000 people every year. Such huge numbers can seem daunting and farfetched but we should never lose sight of the fact that these numbers represent real people whose lives are devastated by tobacco –mothers and fathers, brothers and sisters, friends and colleagues. We should not also forget that most of these smokers picked up this horrible habit at a very young and vulnerable age, lured by the predatory marketing of the tobacco industry. There is no questioning whether Nigerians have awaken to challenge this situation and aim to win the fight against tobacco – the world’s number one cause of preventable death. 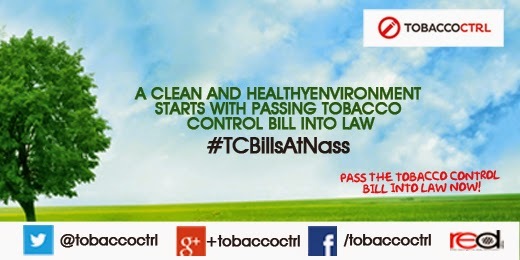 A notable success in this regard is the approval of the draft National Tobacco Control Bill by the National Executive Council and submission to the National Assembly but we cannot rest on our oars and take this progress for granted. We must be as relentless and resourceful in working to save lives as the tobacco industry is in promoting its deadly and addictive products. Nigeria once again has the opportunity to stand up to Big Tobacco and make sure that corporate interests don’t trump the health of its people. It’s time for members of the National Assembly to re-evaluate their priorities. Do they want to be on the side of an industry that lies to the public and promotes a product that kills? If they are truly committed to saving lives and representing the interests of the public, they must not only reject any form of comradeship with Big Tobacco but must also support the swift passage of Nigeria’s National Tobacco Control Bill and vote overwhelmingly in its favor. Our lawmakers should not be lured by the corporate social responsibility schemes of the tobacco industry which they so often use to gloss over the industry’s tarnished reputation and undermine public health policymaking. Lawsuits filed in the United States in the 1990s had revealed that Big Tobacco lied to the public, manipulated policy, bullied governments around the world in order to protect its profits and paid executives and PR firms to develop a strategy to distract the public from the industry’s history of deception. Lawmakers should not be swayed by this ‘show of corporate responsibility’ but ask themselves if a company that manufactures a product that will kill one billion people in this century should be considered responsible and assured a limitedly restrictive environment to operate in Nigeria. Let your voice be heard: Sign the Petition!! !